Besides being hot in my kitchen this month, there are a few things I would like to share with you. 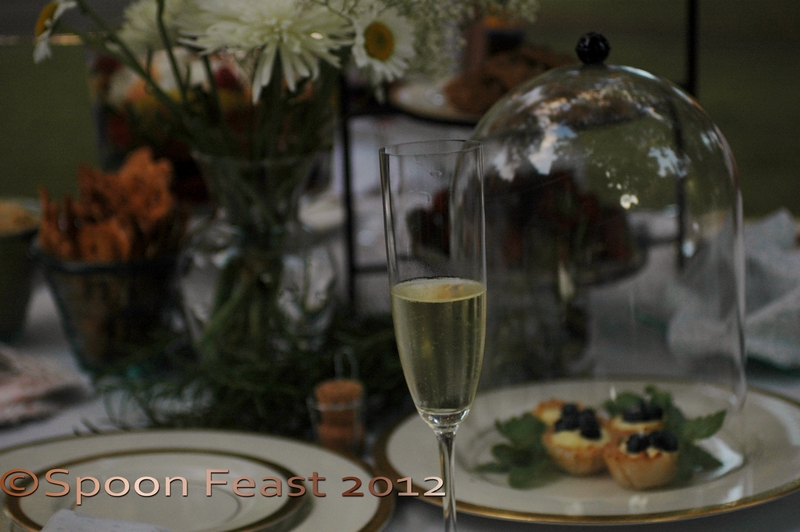 In honor of our kick off event for White Dinners in Charlotte, we did a White Dinner Dessert gathering. So a friend of mine, Joanie, and I decided to make French Macarons and I think they turned out pretty good. We discovered the almond meal we used, which was made with almond skins on the nuts, made all the colors duller than we wanted. 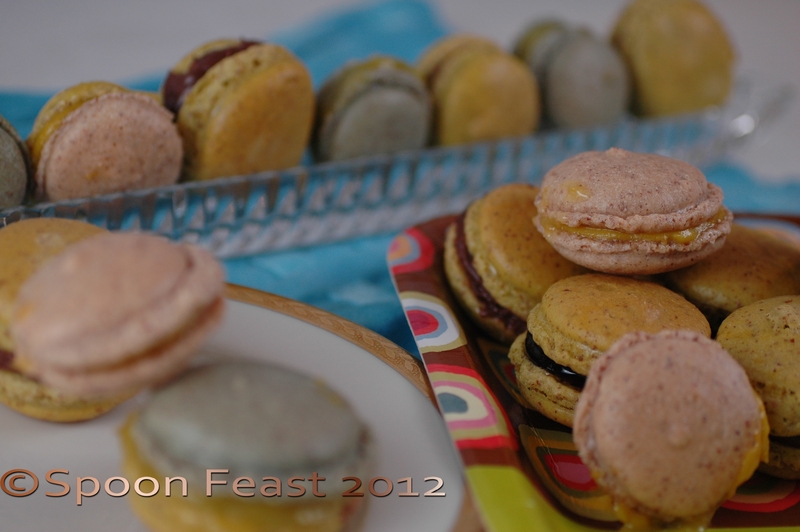 They tasted great and our macarons had feet. Did they taste great; the mouth feel was so hard to describe! Love, love, love these tasty morsels. I had heard each macaron had roughly 100 calories in it so you can guess they didn’t stay around here too long. I threw away what was still around this morning , easier than wearing them on your hips. It was so much fun making them, I look forward to making more. The best part is giving them away before they get stale. some Fresh Figs; shared bounty strikes again. I traded some pickles. 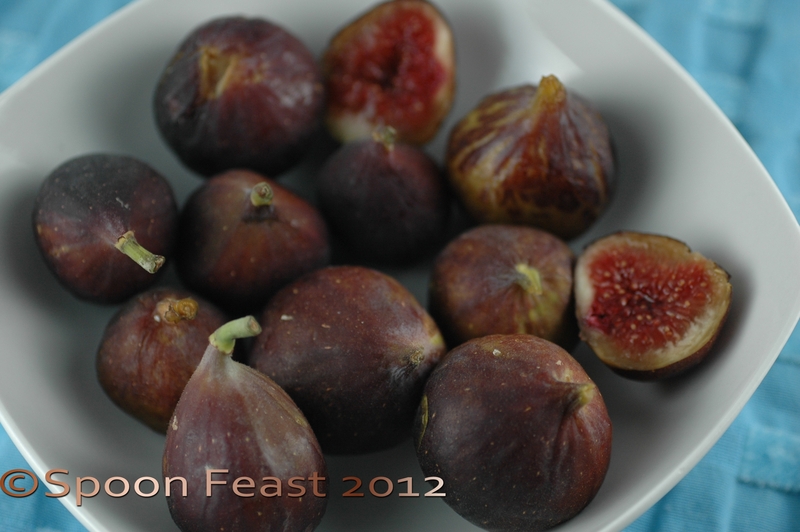 The first dish created with the figs was a chicken dish with rosemary, garlic and figs. The pan was de-glazed with red wine and finished with a splash of balsamic vinegar. It was delicious but no pictures, sigh. The intention is to make an almond fig tart with the remaining figs but, as you can see from the bowl, they are disappearing fast. A dwindling bowl of fresh figs, that tart better hurry up and get made! 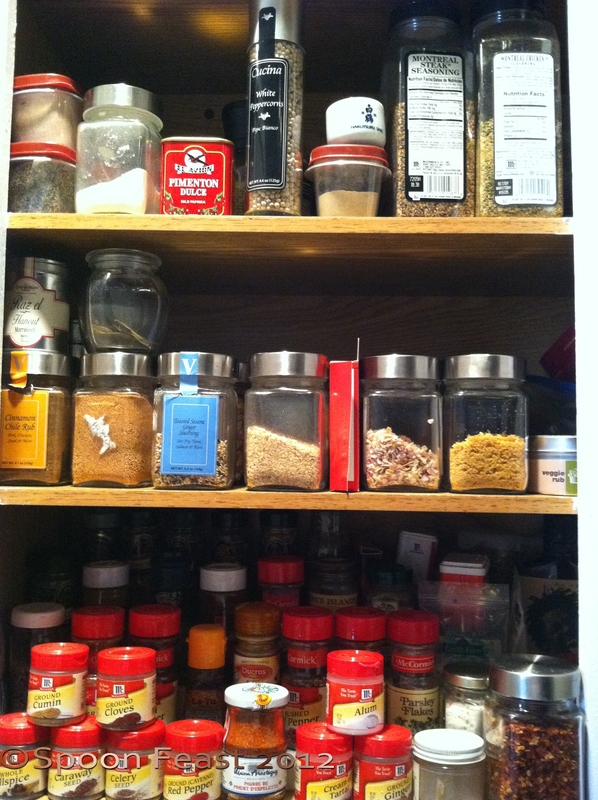 Lastly, in my kitchen this month is a glimpse into my spice cabinet. I try to use things up quickly so I can either make more or buy more. I keep dried, sliced and minced garlic on hand for emergency back up units when fresh garlic isn’t around. Any lemons we use get zested with a fine microplane. 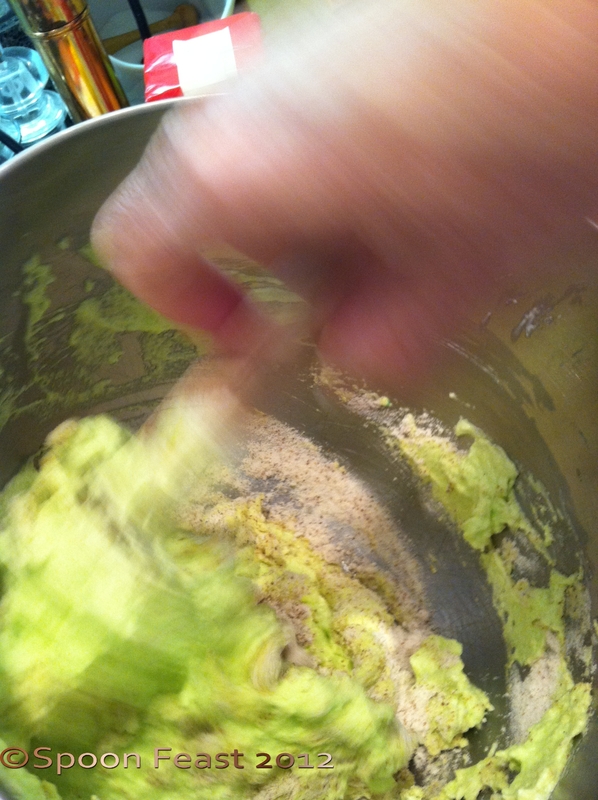 The zest is dried to be used in shortbread, fish, pasta or soup dishes. Why just use the inside when the zest has so much flavor? A standard unit of Montreal Steak Seasoning holds a permanent spot in the cabinet. Those square jars are so wonderful, I use them over and over again. The brushed stainless steel tops make them perfect for storing spices and seasoning concoctions I create and often share. So much food moves through my kitchen it is hard to believe we are only two. But I feed everyone who comes by. Even the UPS man gets cookies. So that is what is in my kitchen this month. I can’t believe a month has gone by already. A BIG thanks goes out to Celia at Fig Jam and Lime Cordial for hosting this marvelous idea! Guess that’s why this post is late! This entry was posted in In My Kitchen and tagged cooking, food, fresh figs, In my kitchen, pierre hermes, white dinners. Bookmark the permalink. I love macaroons and yours are lovely. I can’t believe you threw them out! I would have called everyone I knew to come and get some! Figs are not only delicious- they are beautiful- really like that you sliced one and showed the insides. Thanks for the peek into your kitchen- I really enjoyed this post. After 3 days, the macarons were not worth eating let alone sharing. There were only a few that got tossed anyway. Or else I would have eaten them! Thanks, Heidiannie, for coming into my kitchen this month. Hope to see you again soon! I am smacking my lips Celia! Figs are so versatile. What beautiful macarons. I love the flavor combinations that you chose! I envy how organized your spice cabinet is. Would you like to clean out mine!? I will trade you some figs for that almond tart you want to make (I have them in my kitchen this month too). Thank you Ms. Carrot. Figs are the thing for a few weeks. Wish they would stay around longer. Don’t you enjoy the In my Kitchen posts! I sure do. Someone that has more spices than I do…I love it. I use lemon every day in my tea but never thought to zest them before using. Great idea. You can also use the used lemon parts to clean copper, dip the used bits into salt and rub your copper pots to a gleaming shine! Lovely Macarons and fantastic spice cabinet. Thanks Glenda! I appreciate you stopping by. Oh, I adore fresh figs too, aren’t they just divine!? Wow, you have some spice going on there. And those macarons look delicious!